And, anything covered in glitter/shiny hearts. I thought I'd repost this story I shared here about a year and a half ago. Because nothing says 80's like big bangs. And, no one says 80's like Magnum. Yeah. I went shopping this weekend for Baby Girl (NOT as easy as those without boys would lead you to believe, I'll have you know) and every store sold STIRRUP pants?!?! Seriously? And with the nobel peace prize announcement I feel like I'm in an episode of the twilight zone this morning. I'm with you. 80's fashion should never come back again! 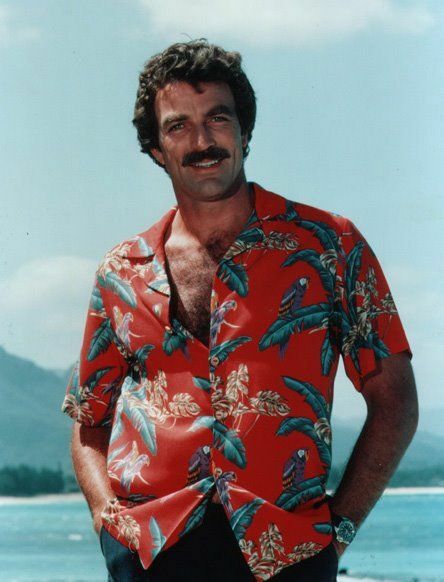 I remember you posting about Tom Selleck before. Great memory! Hilarious! I was just talking with Nancy (who served me some of YOUR hot chocolate today...yum!) about the return of 80's fashion. I mean really, nothing good came from that era of fashion. Leg warmers...again...really? Is it bad, though, that I saw a little girl in R & A's dance class with leg warmers and was thinking, "oh I should totally get those for the girls for dance"? This story still makes me laugh.